I spent Tuesday morning at Ground Level Cafe in Naperville, a part of CCC. 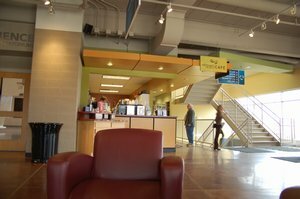 I had some great conversations with Lee Messersmith, their facilities manager, on the role and function of the coffeehouse in a church context, the role of design and branding, and how environment impacts upon experience. We talked about how people get behind something thats missional – it’s about so much more than the coffee, though great coffee is important. We talked about the concept of the ‘third place’ and what it is in our cultures. We talked about how form follows function, and the need to tell a story visually. We talked about facilitating a worship service in a coffeehouse. We talked about the duality of a coffeehouse and the need for both business and ministry plans. CCC have some excellent stuff going on, including a School for the Arts which caught my attention. I read Dave Ferguson’s (lead pastor) book yesterday while at the airport/on my flight. He has some great thoughts on the need for complete clarity and for simplicity in presenting one idea at a time. I’ll blog some from the book, The Big Idea, tomorrow. “Is there room for art when people need food and medicine and shelter? I think there is, and I think the hungry and sick and homeless are at the top of the list of people who need beauty the most.” interesting basis for a mission statement? how do you define ‘hungry and sick’? sounds like you’re having a great time out there, looking forward to catching up when you’re home! @ reuben: I just read that article yesterday, it’s a great piece, and I wholly agree with that art and beauty have an important role and function in society, even (perhaps especially) among the poor. that particular conversation with Lee felt like a critical one for the coffeeshop vision! we def need to hang out asap when i get back. I’ll come cook for you, i promise! @ sarah: indeed, i seem to be doing a lot of traveling… it’s nice! travel is most definitely spiritual for me. i miss you, i’d love to see you soon… i need to come back to NI to do some fundraising soon, can you make some time for me when i come back? it’ll prob be late mar/early april. perhaps i should go and do some work now…. tht’ll make me more effective doing arts stuff.. hmm.. a conundrum. @ Dave: No problem at all, I had a very productive and enlightening morning with Lee! Next time for sure. @ Suz: It is a great article, some of my favourite things too… creativity, marginalized people, and coffee 🙂 You should go do some work though!